When you log in to your WordPress site the first page you see is called the Dashboard. It is a collection of information and data about the activities and actions on your WordPress site. On your Dashboard there are several sections called “widgets” designed to make managing your WordPress site easier. When you first install WordPress the “Welcome to WordPress” widget is displayed to help you find your way around. It has a collection of the most common activities you will perform on your site such as customizing your site or writing your first blog post. This is a quick overview of your site. What theme you are using, how many blog post, pages, comments, etc. This helpful widget allows you to quickly write down a draft blog post, with fields for the post’s title and body. 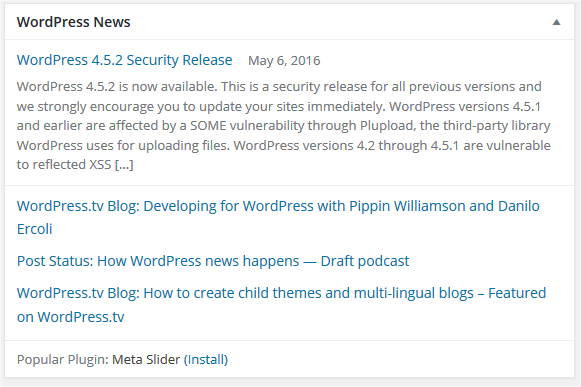 The WordPress news widget is updates from the world of WordPress. It is a great way to keep up-to-date with what is going on with one of the internet’s most commonly used CMS. Some plugins will also add additional widgets to the Dashboard. You can hide or show any of these widgets by clicking on the Screen Options tab at the top of the page. On the left side of the screen is the main navigation menu with links to all of the administrative pages. 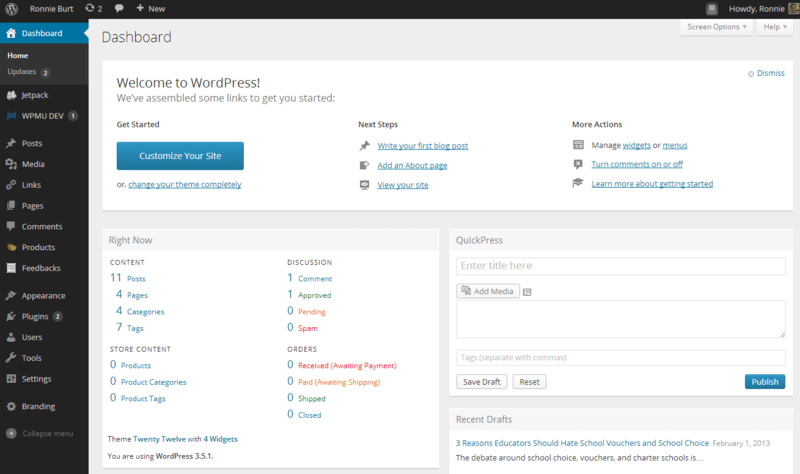 Some themes and most plugins add additional links to your side menu.